has named Clarence and Carol "Health Heroes." We've primed the pump for months by talking up Take Charge, inviting advance orders, and then shipping books to readers around the world—now we’re finding out how much water is in the well. Amazon reviews are excellent and growing. We started with five reviews, all detailed and substantive, from people with different perspectives. We now have 50 Amazon reviews: 45 in the US, four in the UK, and another in Germany. 80 percent are 5 Stars. So many wonderful and thoughtful reviews (along with a few that didn't like it for one reason or another) that we stopped trying to lift a line or 2 from each one. See below. Austrian sports climber Jurgen Reis continues to spread the word about Take Charge on Facebook, Google, Twitter, and other social media. A recent review by J. C. London called TC "The Perfect Book." We couldn't ask for more. Another reviewer says that Clarence "clearly" wants you to enjoy becoming "knowledgeable about this very important subject." Another reviewer from the UK, Alan Fisk, a writer of historical novels and longtime reader of Clarence's advice, wrote: "One tip alone would have been worth the price of the book: I didn't know about the research that indicated that weight loss for a given reduction in net calories would nearly all take place in the first three years. Now I can stop worrying why my weight has plateaued. I haven't been doing anything wrong after all." Ruiseart Alcon, a reader from Scotland, wrote: "I have been training since about the age of six, and at 55 years of age I can honestly say that my enthusiasm for training has never waned. Well, after reading your book it has reached an all time high! Two readers without computers, one from Texas and the other from Australia, were enthusiastic about Take Charge. Texan Tim O'Day wrote that Take Charge "engages the reader with a friendly laid back style even though [the author's] keen, focused enthusiasm is evident." He says the Forget Heavy, Think Effort chapter came at a time when he was beginning "to look at the weights with dread and loathing...The idea advanced by Dr. Carpinelli gave me just the encouragement I needed." Aussie Roy Rose termed TC "an absolute hive of information and research...The revelations on strength training and aerobic work are certainly a positive." Well presented. Well researched. wrote "The librarian," who has reviewed books about everything from golf to vacuum cleaners and pulls no punches. The reviewer bought the book for two friends and highly recommended it. A UK reviewer wanted more about Clarence's own regime, which he called "essential for Bass watchers like myself." 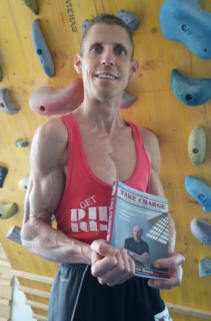 George Beinhorn termed Take Charge "a deep resource of surprising information on fitness and exercise--beautifully told." A runner since 1968, George is a former assistant editor and staff photographer at Runner's World. His latest book is The Joyful Athlete: The Wisdom of the Heart in Exercise and Sports Training. Anne called Take Charge a "great story about self-responsibility for your personal fitness." "Extremely valuable...to the state of individual fitness right now in the USA," wrote another. One reader found it refreshing when Clarence writes in effect, "we used to think and teach [this], but new research shows a better way," while another praised his "utter lack of ego." Tom MacDonald, author of the riveting fiction thrillers The Charleston Connection and Beyond the Bridge, called the writing "superb." For him the best aspect of the book is Clarence's "openness and generosity" in sharing his life experience with readers. What's your opinion? Read Take Charge and share your views on Amazon or other forums where books are reviewed. Help others make an informed decision. Take Charge is absolutely superb!! You have me fired up for training and eating right for several more decades. Kevin Vost, Psy.D. The first thing I did when I received the book was to look to see if you had designed any [new] workout programs and when I didn’t see one, I was a little disappointed, but after I started reading it I realized there wasn’t a need for one. I now have a better idea of how to design a program according to my needs and my schedule…I love the chapter on brain fitness. David Munoz, M.D. Clarence autographed every preorder on Monday and Tuesday, and we shipped books to people all over the country. We also shipped books to Amazon.com and other distributors who had customers waiting for our book. It was a happy—and very busy—week. The following week we shipped international orders, to Canada, Australia, New Zealand, the UK, and other countries. We backed up the lines at the post office, because a customs declaration has to be presented with every foreign shipment. It was awkward, but a small price to pay to put Take Charge in the hands of readers around the world. The response has been amazing. Many have written to thank Clarence for signing their book and tell us they like what they’ve read so far. Others are ordering more copies for family and friends. A medical doctor from Colorado ordered 50 copies to give to his staff and distribute to patients. 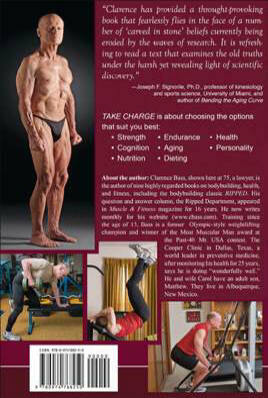 Carl Miller, who coached the United States Olympic Weightlifting team and now owns and operates a fitness center in Santa Fe, called to say that Take Charge is “the book I’ve been looking for my entire life.” He keeps ordering more copies as he thinks of people (17 so far) who absolutely must have a copy. Two that you may recognize are Frank Spellman and Coach Al Vermeil. Spellman, who won a Gold Medal in weightlifting at the 1948 London Olympics Games, introduced Carl to Olympic weightlifting. Al Vermeil is the only strength coach who has been in the NFL, NBA, and Major League Baseball, winning World Championship rings in the first two. Amazon.com and our other main distributor keep ordering more books. Amazon has already posted five reviews. Not only are they all 5 Star, they’re all detailed and substantive, from people with different perspectives. The one thing they have in common is that they have read Take Charge and highly recommend it. Hopefully, many more readers will share their thoughts on Amazon and elsewhere. Clarence did an hour-long interview last weekend (April 27) on WCHE 1520 AM radio in Philadelphia with syndicated talk-show host John Aberle. (See link below) Book signings are being planned for Albuquerque, Denver, and Austin. There is even talk of a conference to discuss selected chapters of the book at the Stark Center for Physical Culture and Sports at the University of Texas in Austin. A number of professors, doctors, coaches, fitness trainers, bodybuilders, and others have expressed interest in taking part. We’ll let you know as planning progresses. If you haven’t ordered your copy of Take Charge, what are you waiting for? Be in on the ground floor; find out what the excitement is all about. Be part of the buzz. We have an advance copy of TAKE CHARGE in hand, and it looks great. The cover (front and back) is spectacular. After an unexpected delay, our shipment is due to arrive on April 4th or 5th. If all goes well, advance orders will begin going out on Monday, April 8th. Those who paid for Priority Mail should have their books about a week after that date. Media mail shipments can take up to three weeks. We hope you enjoy TAKE CHARGE as much as we enjoyed writing it. As a combination of science and life experience, we are told that it is unmatched. We sized our cover one eight of an inch too small, and it cost us an extra week of production time. Everything has been corrected, we have approved the cover and text proofs, and the book is now in production. We are told that it will take about 18 working days to produce the book and ship it to us. Allowing a week for transit time, we expected to take delivery on or about March 29 and begin filling orders on or about April 1. The proofs look great and we can't wait to hold the book in our hands--and ship it to our friends everywhere. 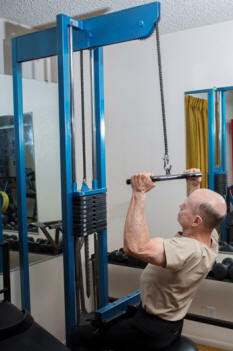 Weight training grabbed my attention when I was about 12—and never let go. I started learning then and added to my knowledge with the passing years. I began with strength training basics and later added new dimensions of fitness one by one: nutrition, aerobic exercise, weight control, motivation, exercise physiology, and health. This book is about new things I’ve learned in the last several years—and how they can help readers take charge and improve their lives. The wonders of modern science keep uncovering new ways we can help ourselves live longer, stronger, and healthier. The paths to success in fitness and health have never been more open and diverse. We can take charge in ways that suit us, ways that we enjoy and do best. For example, there are many forms of resistance training that build strength and muscle. Some of them also build aerobic capacity. On the other hand, some forms of aerobic exercise also build strength. What’s more, both strength training and aerobic exercise improve brain and other bodily functions. Another emerging area is diet dynamics, expanding our understanding of the idiosyncrasies of dieting and weight loss. We’ll talk about these and many other new developments—along with a few old ones that have reemerged. That barely scratches the surface of the wondrous opportunities opening up to people willing to take charge of their bodies and their lives. “Most Muscular Man” award in the Past-40 Mr. USA. About that time my focus began to change. I began to realize that the only competitor who really counted was me. I had no control over what others did or achieved, but I had complete charge of myself. I could set my sights on any goal that excited me and train in ways I thought best to achieve that goal. I was in charge of myself. I set the rules and judged the results. When I achieved one goal I chose another goal. I looked for ways I could reasonably expect to improve. It worked marvelously well. As the years rolled by, I became more enthralled with the process, especially for its incredible long-term results. Again, I was competing with myself. I saw people all around me who looked and acted old at 40 and beyond. I decided to follow another path, one that I set for myself. I gauged what I could do based on my own results. I decided to ignore my age as much as possible. I kept pushing myself to improve in ways that I found realistic and appealing. I set goals based on my own experience, not my age. When I encountered road blocks, I looked for ways to overcome them, not by force, but by using my mind and methods I have learned in a lifetime of study and taking care of myself. It has almost always worked. At 75, it’s still working. I intend to keep training and looking for ways I can improve. In short, I have done what I hope you will do: take charge. have been filled with new discoveries in the areas I’ve already touched on, and more. Discoveries that all of us—men and women, young and old—can use to shape our future. Let’s begin with a look back, at two landmark books, one on aerobic exercise and the other on the benefits of strength training. To understand where we’re going it helps to know where we’ve been. Order TAKE CHARGE now. If we have your current address and credit card information, simply send us an e-mail: cncbass@aol.com. If we don't have your current information, call 1-505-266-5858 or fax 1-505-266-9123 your order. Be sure to tell us whether you prefer media or priority shipping. Everything about a writing a book seems to take longer than anticipated. We spent most of December putting the final touches on Take Charge. Photo selection, placement, and captioning took two full weeks; the most diverse ever in our books, each photo adds context and understanding to the text. The rest of the time was devoted to the table of contents, the copyright page, dedications, and acknowledgments. Last minute proof reading also took time. We finally got the whole package off to the composer who will put it into book form and transmit it to the book manufacturer. We don't have a precise page count, but Take Charge will be about 40 pages longer than our last book, Great Expectations. We hope to be in a position to begin taking orders on the first of February or soon thereafter. We'll announce a release date as soon as we know. We've learned over the years that readers are drawn to our books because we give reasons as well as regimens--"why" as well as "how." They tell us that they like hearing about the underlying research. TAKE CHARGE is chock-full of exciting research. As we've been telling you over the last several months (see below), our new book in grounded in the latest scientific discoveries. The subtitle, Fitness at the Edge of Science, is Carol's inspired idea. It's a perfect fit. TAKE CHARGE is about choosing the options--science has given us many--that suit the individual best: The coverage is comprehensive: strength, endurance, leanness, cognition, aging, health, nutrition, dieting, and personality. It's all there. What you need to maximize your fitness potential. To become lean and fit for life. Readers also want to hear from people who practice what they preach. 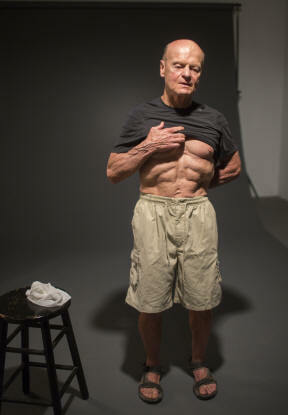 Clarence has been in the fitness trenches for over 60 years. Carol has been there with him most of those years. Pat Berrett and Laszlo took many pictures of the two of them for the new book. (The photos below are all by Laszlo.) The second photo shows Carol off camera at the Pat Berrett photo shoot. 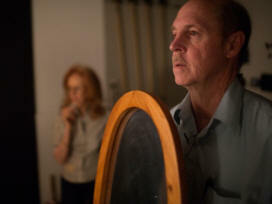 Next is our long-time Albuquerque photographer, Pat Berrett, at work during our photo shoot. Again, Carol is in the background. 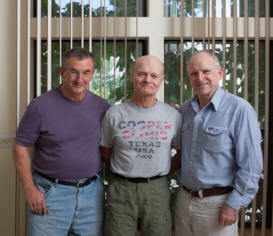 The last photo shows Laszlo, Clarence, and Wayne Gallasch, who happened to be in Albuquerque during photo week. The writing is done. Final editing was completed a few days ago as this is written. The photos for the front and back covers have been selected and the final cover design is being worked on now. What remains is photo selection and placement, book composition, and printing. That will take a few more months. We expect to release the new book in the first quarter of 2013. 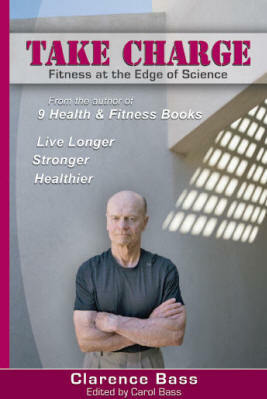 The full title of the new book is TAKE CHARGE: Fitness at the Edge of Science. Clarence finished the last chapter during November. Chapter 12, the final chapter, is about "Take Charge People." Six people are profiled, all successful in their own way. Each has a fascinating story to tell, each different, each inspiring. It's our favorite chapter. We hope and believe readers will love it. We can all learn from their examples, not by imitating them, but by appreciating their uniqueness and drawing inspiration to find our own way. Science has opened up many new roads to fitness in recent years. Our task is to find the path that suits us best. The purpose of TAKE CHARGE is to help people do that. Last month we featured three new photos calculated to inspire. This month we present new photos that illustrate matters discussed in the book--and more. The first one shows Clarence demonstrating the Concept 2 Ski Erg for our Aussie friend Wayne Gallasch. The Ski Erg is the latest addition to our home lineup of aerobic exercise equipment. The next photo shows Clarence doing a pulldown in the Ripped Enterprises gym. We told you a couple of months back that we took photos in many settings. Here are two taken in the front and the back of the Ripped Enterprises building--one a of Clarence smiling and the other in serious mode. Our upcoming book (due out early next year) has a new and unique theme; like all of our books, it stands alone. Take Charge is about selecting the training plan that suits your physiology and personality. There is no single best way to exercise or eat; there are many. It's up to each of us to find the way that works best. Generally, it's the type of training that you enjoy and do best. It's also the style of eating the suits your taste buds without compromising your health. In both cases it's the plan that you are willing and able to stick with over the long term. Take Charge spotlights new discoveries that are opening up more training and diet options than ever before. We've written about many of them on this website. Our new book collects the most important findings in one place--allowing you to review and evaluate them. Clarence tells what works best for him--and why, along with the other options science has opened up for all of us. Readers are encouraged to find the plan that suits them best. It's amazing what we have learned in recent years. Training principles and diets that were once thought to be sacrosanct are proving to be wanting or only one of many good options. It's all there in 12 fact-filled, logically arranged, and easy to read chapters. And the new photos; we have many wonderful photos to illustrate matters discussed in the book--and to inspire. The three photos shown below fall largely in the second category. The first photo, taken by Pat Berrett, shows Clarence's right leg seven years after his hip replacement. In the second photo, taken by Laszlo from the sidelines during the Pat Berrett studio session, Clarence flexes his abs for Berrett's camera. What a week it was! Laszlo Bencze, who took most of the photos in Great Expectations, returned to Albuquerque to take photos for our upcoming book, Take Charge. For five days we took photos in carefully selected settings to show Clarence on the eve of his 75th birthday. We moved from one end of the city to the other taking photos from dawn to dusk. We began at home with his "Morning Motion" routine and, as the week progressed, moved to the Ripped Enterprises gym for a weight workout, to the National Hispanic Cultural Center in southwest Albuquerque for photos in casual dress, finishing in the foothills east of Albuquerque as the sun was setting. In the course of it all, Laszlo photographed Clarence making a 500m PR on the Concept 2 Ski Erg, with our Aussie friend Wayne Gallasch looking on. 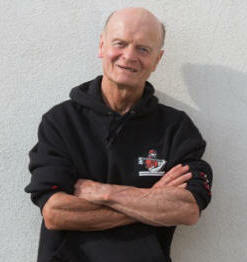 (Wayne holds the World Record for the 500m row in the Concept 2 World Rankings for lightweight men age 70-79.) We also worked in studio photos by Albuquerque photographer Pat Berrett of Clarence posing. On the final morning, Laszlo photographed Clarence outside on the Concept 2 Rower. That's just a sampling of the various locations and activities photographed during the week; there were more. We will be sharing some of the photos--we've only seen a fraction of them as this is written--with you in the months leading up to the release of the new book early next year. 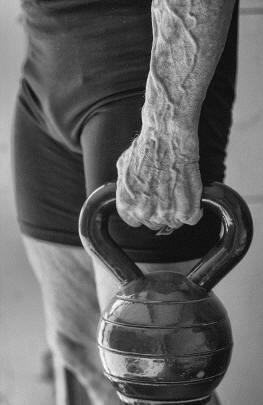 We begin with a photo taken in the last minutes of the shoot; it shows Clarence holding a kettlebell. It gives you a hint of the magic Laszlo can work with his camera--and the condition Clarence has achieved at 75. A company specializing in healthy lifestyle and health promotions has purchased the exclusive right to publish a German language edition of Great Expectations. The owner of the company, a medical doctor and university professor, has been favorably influenced by our books since reading Ripped, and thought Great Expectations would be a good fit for his company. We are delighted to have the additional exposure in the large and prosperous German market. Fit Magazine (April 2012), a quarterly publication of the Albuquerque Journal, New Mexico's largest newspaper, honored Clarence with a full page feature called "Built To Last." Fit interviewed Clarence after learning that photos of him are on display at the Joe and Betty Weider Museum of Physical Culture located at the University of Texas in Austin. The magazine wanted to know what the photo exhibit is about and why he was chosen. 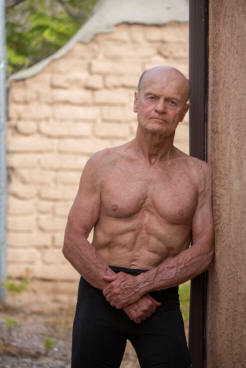 The title of the feature story conveys the message of Clarence's photos: Start exercising early in life and don't stop; do that and you'll build a body to last. Our thanks to Amada and the FIT editors for recognizing Clarence's achievement. We've been hearing about it all over Albuquerque. Dan and Clarence have become good friends over the years. 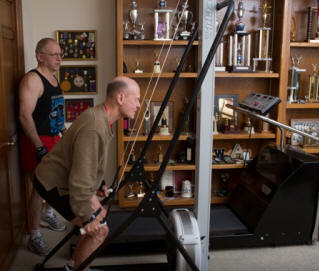 A lifetime trainer, weights and aerobics, and a true aficionado of fitness, Dan critiques Clarence's articles every month without fail. He sees the big picture and has a wonderful grasp of what Clarence is trying to accomplish through his columns and books. Dan "gets it" and puts it into practice in the way that suits him best. A very busy guy, he stays strong and fit with super efficient workouts--that really work. His treadmill times at the Cooper Clinic (over 28 minutes) put him in the elite category for his age, and any age. You'll find many of the details in our Success Stories (10). We couldn't be more pleased with the dedication. Clarence is honored and touched. We were surprised and delighted to receive a call from Kim Goss, Editor in Chief of the Poliquin Performance website (charlespoliquin.com ), requesting photos for a feature article Charles had written about Clarence. Coach Poliquin has written a series of articles relating things he has learned from various people in the strength and fitness field. Poliquin, a well-regarded strength and fitness coach and author, is favorably quoted in our book Challenge Yourself as recognizing that both volume and high-intensity training build muscle, but for different reasons. "Both camps are right," he wrote in The Poliquin Principles (Dayton Writers Group, 1997). Poliquin's piece is titled Five Lessons I learned from Clarence Bass (A look at a lifetime of physical superiority). It is well written and quite insightful. He dug deep into our website and came out with some real gems. He says some very nice things about Clarence. Check it out and decide for yourself. Here's the link. Take a gander at his website while you're there. Our sincere thanks to Kim and Coach Poliquin. Wayne and Tina Gallasch, our friends and DVD co-producers, have posted clips from the 3 RIPPED DVDs on You Tube. People have been asking for it for a long time, and we’ve finally done it. If you’ve wondered about our DVDs, the clips provide a good preview. 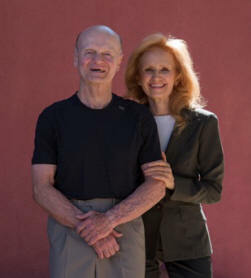 Copyright © 2012 - 2013 Clarence and Carol Bass. All rights reserved.